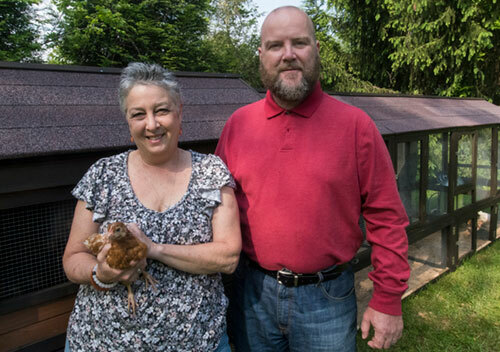 Toni and Scott with one of their young chickens in 2018. The flock has grown and now supplies fresh eggs for the Folkestone kitchen. Ahhh, those morning aromas. Bacon sizzling. Coffee steaming. Pancakes on the griddle. 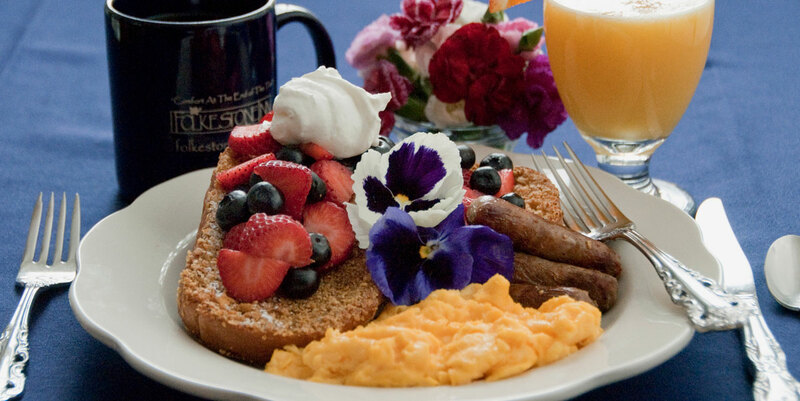 What a delicious way to greet a new day at the Folkestone Inn in the Smoky Mountains. For your complimentary three-course breakfast enjoy dark organic coffee starting with homemade sweet breads and fresh fruit then onto the main course consisting of specialties such as sweet potato hash with poached eggs, sausage and candied bacon, lemon soufflé pancakes with warm blueberry compote, and omelets with fresh herbs and vegetables from our organic garden. Juice, coffee and tea are also served. 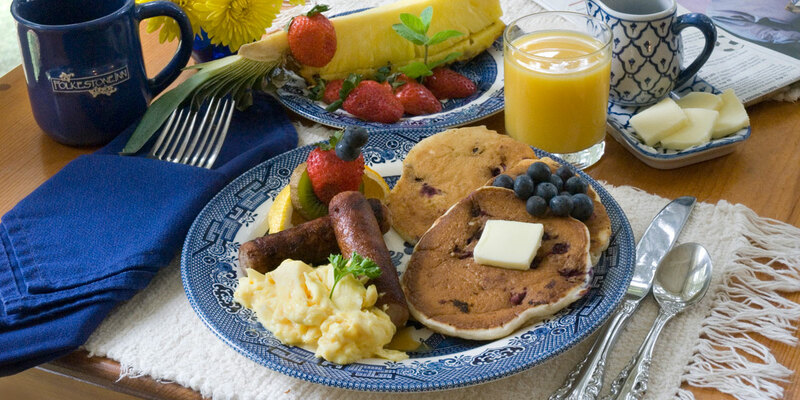 We take pride in our bountiful gourmet breakfasts. 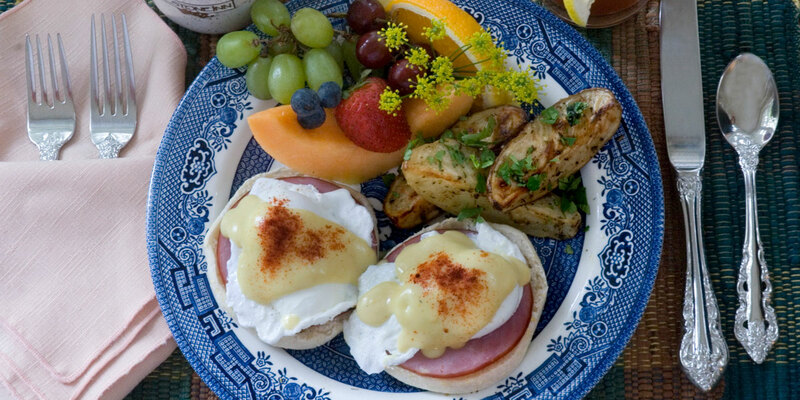 We use farm fresh eggs, dairy, house-cured and smoked breakfast meats. Toni’s homemade jams are made from local fruits and are guests’ favorites. 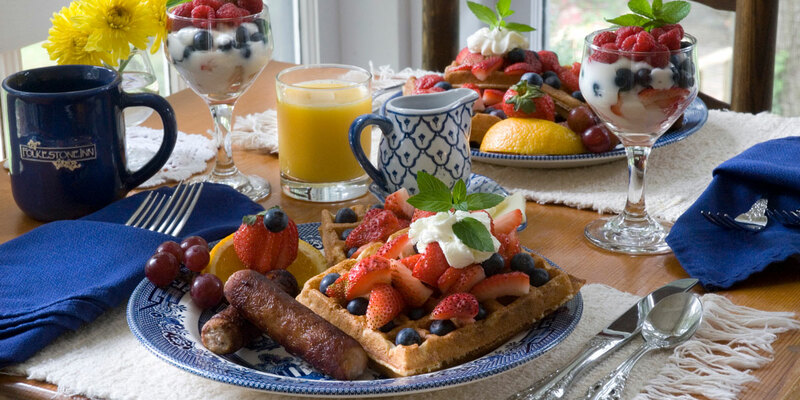 A light breakfast is available with advance notice. Coffee is ready at 7:30 am. Breakfast is served at 9:00 am unless otherwise notified. Please notify us in advance of any dietary allergies or restrictions. Toni and Scott are great hosts. The place was very clean. Breakfast both days was awesome. Neither of us eat gluten and they were very accommodating, preparing us a separate breakfast both mornings. It was a great place to stay with an ideal location.